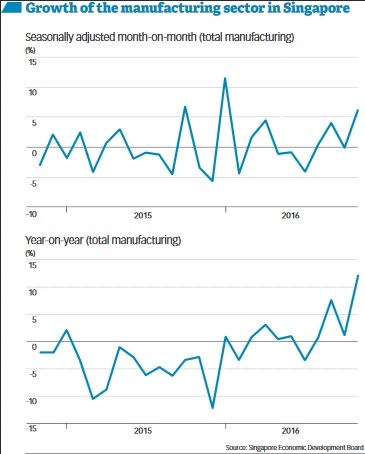 Better-than-expected Singapore manufacturing output data has brought some cheer to the festive season, with economists sanguine that the odds of a technical recession in the fourth quarter are reduced. The 11.9 per cent total manufacturing output growth year-on-year in November was lifted by strong output from the biomedical manufacturing and electronics clusters. A Bloomberg poll of 15 private sector economists showed a median estimate of 1.6 per cent industrial production growth year-on-year in November. Excluding biomedical manufacturing, output grew 6.4 per cent in November compared to the same month last year, the latest data by the Economic Development Board (EDB) on Friday showed. When adjusted seasonally, manufacturing output rose 6.1 per cent in November, as compared to October. With the more volatile biomedical manufacturing stripped out, output grew 5.1 per cent month-on-month. Biomedical manufacturing turned in a robust 34.8 per cent growth in November's output, compared to the same month last year. The pharmaceuticals segment produced 36.1 per cent more output, mainly due to a different mix of active pharmaceutical ingredients and biological products produced. Higher export demand for medical instruments boosted the output of the medical technology segment, which grew 30.8 per cent. UOB economist Francis Tan said he was surprised by the strong performance of the pharmaceuticals segment. He said: "It is the wild card. Pharmaceuticals is usually very hard to predict." CIMB Private Banking economist Song Seng Wun said: "We need a drug boost every now and then." But the economists are not surprised by the strong showing of the electronics cluster, the biggest manufacturing cluster here. The electronics cluster's industrial production grew 24.2 per cent in November, where the output from the semiconductor segment jumped 49.6 per cent. Mr Tan said the segment has seen a double-digit growth for the past nine months, signalling a consistent pickup of demand boosted by greater demand from China for intermediary inputs, which Singapore produces. He said: "Demand is improving due to excess capacity cuts especially in China (from 2012 onwards). The problem was accentuated by a slowdown in global demand in mid-2014 onwards." But the excess capacity problem stopped in recent months, he added. He said: "They have cut down production so much that they are now not producing enough to cater to the demand. China realised they need to ramp up production, so they are importing more from Singapore." However, the transport engineering cluster continued to be weak. Its output contracted 14.8 per cent year-on-year. Although the land transport segment expanded 12.2 per cent, this was offset by a 23.6 per cent decline in the marine & offshore engineering segment and a 4.2 per cent decline in aerospace segment. The low oil price environment continued to affect rig building activities and demand for oilfield & gasfield equipment. Looking forward, however, risks are abound and economists are cautiously optimistic. Mr Song said: "It looks like the chip recovery can be sustained in 2017 underpinned by the gradual recovery in consumer confidence and gradual improvement in demand for big ticket items like cars. We saw China and the US setting record auto sales and a lot of chips are used in automotives." Mr Tan said: "Concerns on the still-weak exports conditions, (in) particular the uncertainty evolving Brexit, more referendums in the EU, and the possible implementation of import tariffs on US imports from China (where Singapore exports to the latter) will provide a lot of uncertainties for Singapore's manufacturing sector."